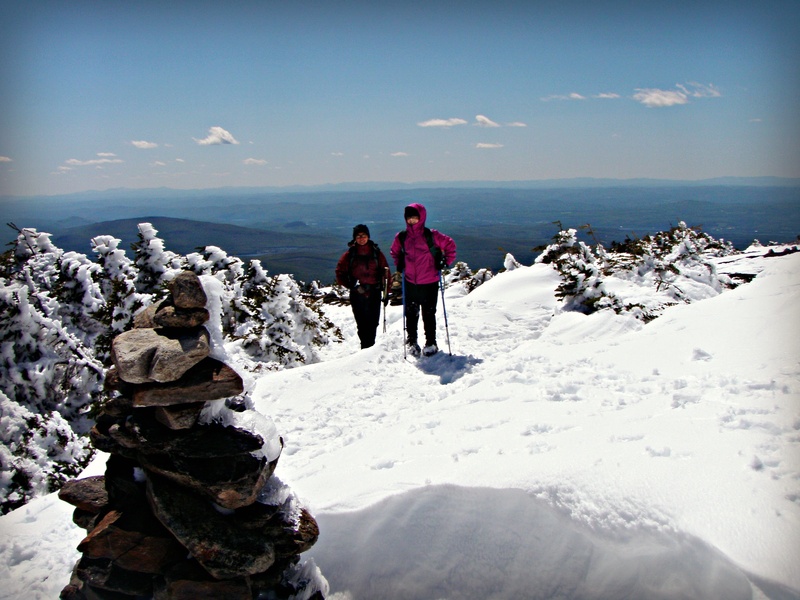 Getting our winter alpine on near Mooilauke’s summit. At 2,000 feet, the trail is clear, the day warm, and we move in t-shirts unencumbered by gloves or hats or fleece. At 3,000 feet, one hour later, we are six inches deep in wet snow and icy rain blows off snow-covered trees and we are forced to wear heavy rain gear and traction. 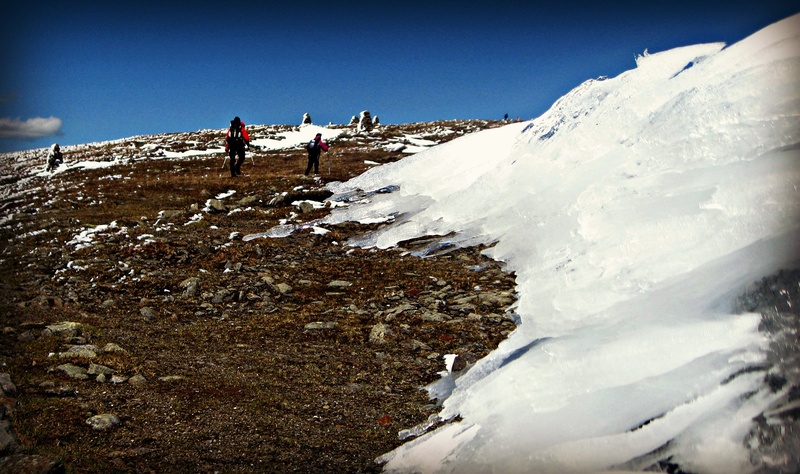 At 4,000 feet, at the ridge, we huff through ankle-deep slush that pours down off Mt. Moosilauke in a river of brown, deep mud. At the summit, 4,802 feet, the wind blows in 20-30 mile per hour sustained gusts and we must duck down behind the rime ice encrusted ruins of the old summit lodge to keep, it feels, from flying off the mountain. Our whole Grape Nuts Fit Summit Sampler hike is a challenging workshop in contrasting conditions. We literally face every type of weather. It is a difficult day, and an amazing, beautiful one. 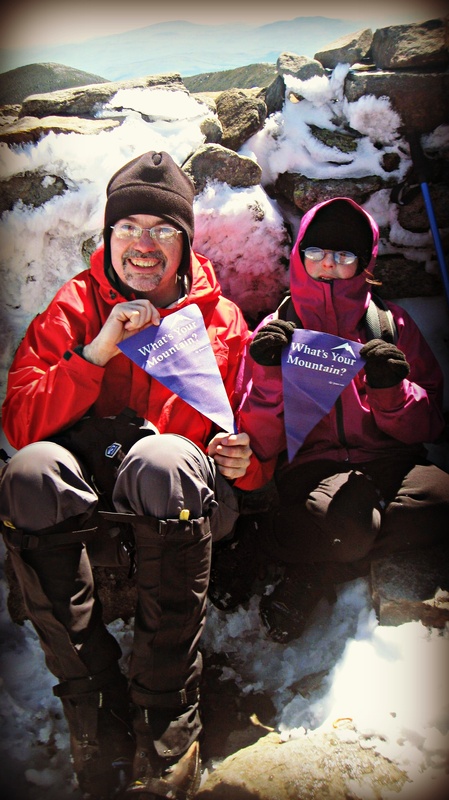 Showing off our Grape Nuts flags at the summit. Above tree-line, the sun beats down on us from a deep blue sky as we struggle against the wind. Tough Cookie holds her arms out and laughs, wide-eyed, as the gusts threaten to lift her off the ground, flapping wildly against her pink jacket. Janelle’s 2nd 4,000 footer (the 10th highest mountain in New Hampshire) throws it all at us, and we let it, grinning and working hard all the way up. On a day like today, you can’t fight against the mountain. We just shake our heads, and absorb what it sends. Our job is to hand out Grape Nuts Fit sample boxes. We’ve stuffed Janelle’s new Grape Nuts pack full of them and half-expect it to be difficult to give it all away. It’s not. Perhaps it’s the nutty conditions that put everyone in a good mood. Maybe it’s just that getting free snacks on the trail is a welcome treat. But nearly everyone takes them, and laughs along with us at how preposterous it is that here we are – on behalf of Grape Nuts – giving away samples, on a day like today, out of this little girl’s black and purple back pack. The day rolls on, and we take our time; partly because of conditions and partly because it’s been a while since we attempted a hike of this nature and are out of shape. Our muscles are slow to respond. But Tough Cookie weathers the happy ordeal in typical fashion. She’s by far the youngest hiker on the mountain this day and is greeted with a mix of awe and disbelief by fellow hikers. Big drifts on the way up! She lets out a bunch of fake ughs and sighs and at one point during a break she even lays down on the comfy soil to rest. She is tired, but mainly she’s just being a ham. By the time we reach the car, her pack is nearly empty of samples and we are all soaked and muddy. But we all grin foolishly at each other, share high fives and hugs and await the inevitable happy creep of sore knees and shoulders. It’s summer now. In less than two weeks, Janelle and I will set out on a different kind of pilgrimage as we take our story to readers far and wide across New England. Days like this will be become more precious, and perhaps, rare. But 4,000-footer #2 is a good one. Moosilauke put on quite a show, and the Grape Nuts flowed like slush from a mountain.